#66 - 2018/12/04 - Botanic Park, Adelaide, Australia - bjtourss Webseite! Lost Highway switches places with This House Is Not For Sale and opens the show. Knockout is dropped and Who Says You Can't Go Home takes its spot as the second song. Raise Your Hands replaces Whole Lot Of Leavin'. 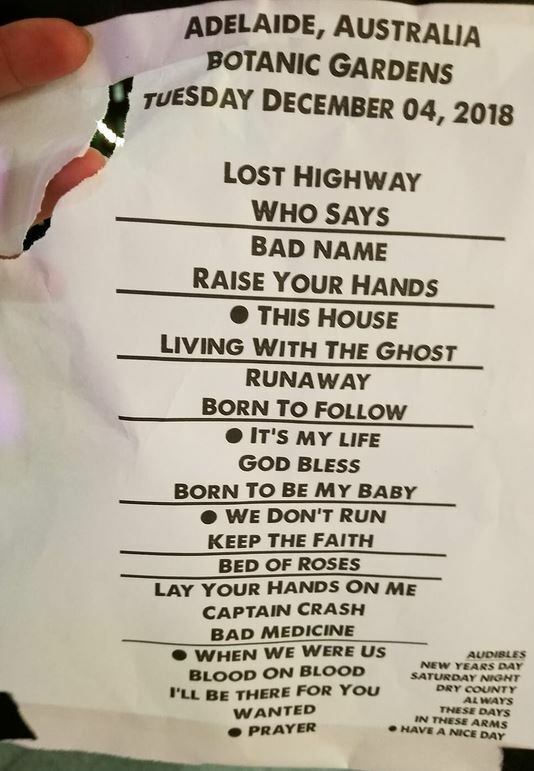 Living With The Ghost and Runaway are added. Captain Crash & The Beauty Queen From Mars replaces I'll Sleep When I'm Dead. When We Were Us is added and opens the encore.